The Salvation Army in Williston, N.D., is helping homeless job seekers by buying them a one-way ticket home. Hundreds of job seekers arriving in the oil boomtown of Williston, N.D., are being sent back to where they came from after ending up homeless. Thanks to an influx of people and money to the area, the Williston Salvation Army has seen its charitable donations more than double to $358,000 in the past two years. And it's using some of this money to relocate people who can't afford to stick around. The organization buys gas vouchers, one-way bus and train tickets, or puts money toward flights for about 20 people per month. Last year, it helped more than 200 people leave. "Sometimes they're better off going back home," said Joshua Stansbury, a North Dakota native who runs the Williston Salvation Army with his wife, Rhegan. People drive hundreds of miles to Williston looking for work. They're often lured by oil jobs paying six-figure salaries, but every job pays well and -- with an unemployment rate of less than 1% -- almost every industry is hiring. Even fast food workers make upwards of $15 an hour. But it's not as easy to find a place to live as it is to find a job. Housing has become extremely scarce, and rents have skyrocketed -- leaving many people homeless. "If there's [any housing] available, they're going to pay a minimum of $1,200 for a single-bedroom apartment or even studio," said Stansbury. 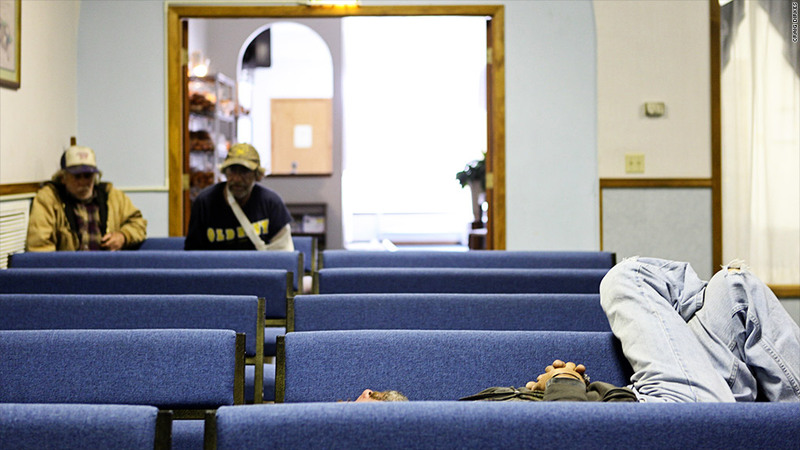 The nearest homeless shelter is more than 200 miles away in Bismarck so a local Lutheran church lets up to 30 people sleep on its floor. Many others sleep in their cars in parking lots. Since the Salvation Army is located a block from the train station and across the street from the bus station, people arriving in Williston often head straight to its offices for help because they don't know where else to go. "Sometimes it blows my mind -- we've had people move their entire family out here without doing any research, they just hear there are jobs in North Dakota," Stansbury said. "Then we have people who have done the research and were promised by a company they would have lodging and a job. But they come up and the job is no longer available." One woman wanted to return to Texas after spending a month sleeping in her car, unable to find work. The Salvation Army gave her a gas voucher for the drive home. The organization can only afford to give up to $80 toward trips home, so people often round up any additional money they need from churches in the area, said Stansbury. Other destinations with large homeless populations -- like cities in Florida and California -- also have programs that buy tickets out of town for homeless people who want to reunite with their families. Relocating the homeless can be controversial, however. It can ignore the root of the problem and instead simply transfer it to another part of the country if it's not done properly, said National Alliance to End Homelessness president Nan Roman. But as long as people aren't being forced out and they have somewhere to go where people will help them, such programs can be beneficial -- and they can save money for a city, state, or aid organization, she said. "The big issue is whether people really want to return home, or whether the community is trying to get rid of them," said Roman. Stansbury said the Salvation Army only helps people return home if they want to leave, and it does reduce costs for the organization. Any savings helps, because while donations are increasing substantially, they're still not keeping pace with the surging demand for help. Last year, the organization provided help -- including meals, groceries, clothing, and assistance with housing, medical bills and electricity bills -- to nearly 3,000 individuals and families. That's up more than 80% from the year before. People can receive aid up to three times, a rule the Williston Salvation Army has imposed to prevent dependency on its services. The number of people it has helped look for jobs and prepare for interviews has more than doubled. Heat is also in high demand, given the brutally cold winters in North Dakota. And since many job seekers live in their cars or RVs, it also assists with propane costs to keep people warm. One of the biggest challenges for the organization is finding help. It's trying to hire an additional case worker, but it can't find anyone willing -- or qualified -- to take the job. "It's hard to get people to dedicate one or two hours to volunteer," said Stansbury. "And for the positions we're hiring for, it's tough to even compete with fast food [chains]."